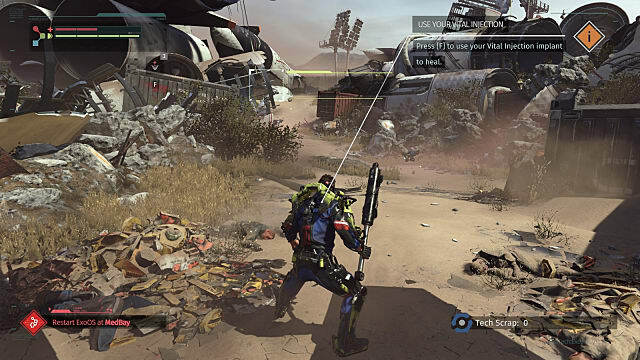 I've got to be honest here: I hear the term "sci-fi Dark Souls" get tossed around and wasn't actually that excited for The Surge. I don't see the appeal of that particular series, and it seems now we've got to wait patiently for it to hit all the different styles from samurai to medieval to sci-fi before finally dying out in popularity. Having now given The Surge a fair shake, I'm not sure it's fair to simply call it a sci-fi Souls clone, although its clear that was the basic inspiration. If I had to boil it down, I'd say its essentially Space Siege meets Lords Of The Fallen, with a more interesting visual flair. 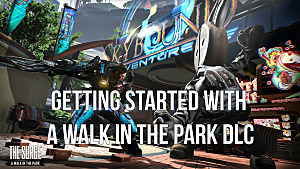 Whether its the aesthetics, the tweaked approach to difficult ARPG gameplay, or the focus on crafting, this particular entry in the style is a lot more consistently entertaining than anything presented in the typical Souls fashion. 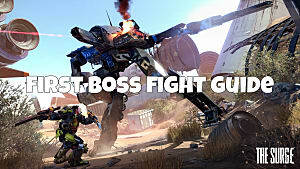 The heart of the gameplay is dodging and smashing combat, and that aspect is actually really satisfying. Bear in mind that statement is coming from someone who gets very frustrated with the Souls style very quickly -- so if you enjoy the masochistic aspects of those games, then this one may be too easy for you. That said, the combat's difficulty level is pretty punishing. It's easily a level of magnitude harder than the average action game, even if its not on the level where you'll be throwing your controller every few minutes. Of course there's a stamina gauge to manage between your different types of strikes and to balance attacks against dodging or guarding. If you aren't smart here, three or four hits will have you dead. The hardest part is when new enemies show up in surprising locations, taking you out before you've figured out their attack patterns. There are a lots of cases where enemies with unknown attacks styles are lying in wait in unexpected areas. Your starting gameplay style will change a bit depending on which "class" (or in this case, which base exo-rig suit) you choose. Rather than a static clicking option at a character creation screen, the selection is built into the intro as the main character decides whether to apply for the agile and versatile Lynx technician position or the Rhino heavy tech position at Creo. I went with the Rhino. Subtlety isn't my strong suit. Besides your basic attack and dodging types, a system is in place for targeting specific body parts of an enemy, with some locations more armored than others. Can't get through a heavily-armored torso or metallic limb? Switch to the soft, squishy head instead! Because the enemies have the same piecemeal equipment style as you, sometimes you'll be tearing off legs or smashing arms to bloody pulp instead. There's more to this than just damage reduction though. The game is based around building a suit of armor component by component, which means you need to pull specific parts off dead enemies. 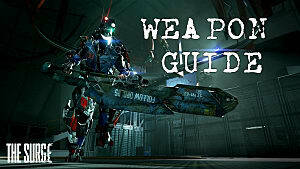 In a wonderfully brutal addition, you have to sever body parts to use in your own exoskeleton. You don't always get the part you are going for, though, even if the execution was timed correctly -- and sometimes you'd rather have more tech scrap than a severed part. 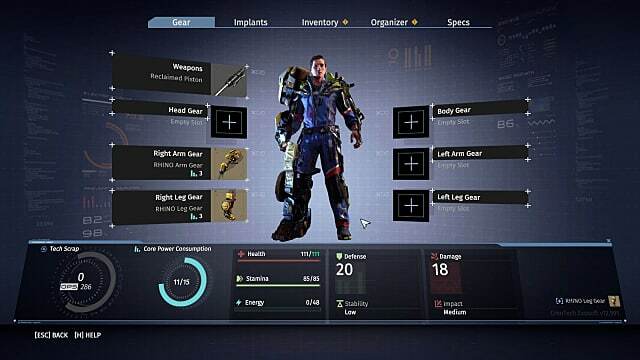 Besides giving you new parts to work with, you can also learn about particular strengths and weaknesses of enemies by seeing the specs on severed equipment. 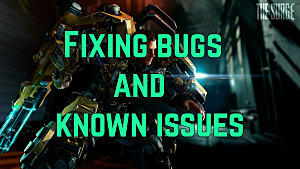 This adds in a strategic element that makes the grind more tolerable while trying to build a specific component or get the parts necessary to upgrade an existing piece of armor. As a bonus, the slow-motion, camera-blurring finishing moves that result in a severed piece of equipment are simply a thing of beauty. 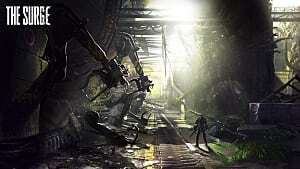 Think Spartacus in a sci-fi robot factory, and you've got the level of gore down perfectly. On the melee front, there are satisfying differences between the weapons in terms of speed and attack radius, and they all look phenomenal because most of them aren't meant to be weapons. You might have a snapped-off piston, an electrified hydraulic press, jagged forklift pieces, and so on. Crafting new parts and upgrading existing ones, in addition to swapping out implants for different bonuses or skills, provides a very well-rounded experience overall that isn't all combat -- even though everything is essentially based around destroying robots and zombie cyborgs. 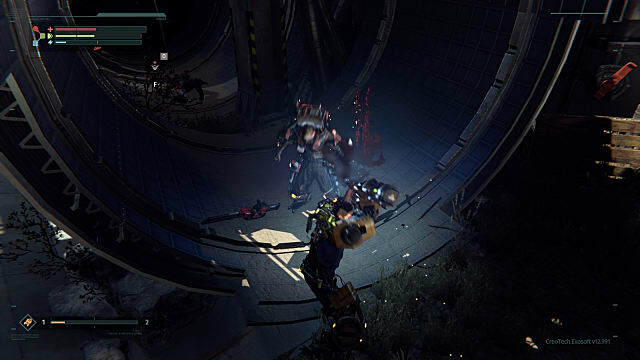 Despite the high level of quality and fun on display, The Surge does suffer from a major setback -- and it's not the overly difficult nature of the enemies. Rather, its how those enemies respawn in their original positions every time you return to the med bay. 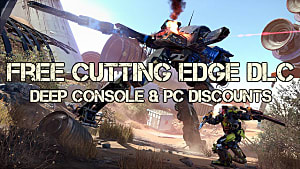 On the one hand, that means there's lots of opportunity to earn more tech scrap and get more severed parts. On the other, this sort of destroys immersion, since it feels less like you are moving through an unfolding story and more like you're wandering around an area filled with actors who reset every time you rest. As with the other games in this style, this element adds in an ungodly amount of grind. You will "git gud," but the downside is having to re-kill the same enemies in the exact same locations a couple of dozen times. You'll have to make a tactical decision -- return with the amount of tech scrap you've got now that might be enough to upgrade your suit's core, or keep fighting and potentially die and lose it all unless you hack your way back to your corpse? Either way, though, it results in that same grind. When you go to the med bay the enemies respawn, but they also respawn if you die and have to return to your body's loot pile -- so it's kind of a lose/lose. As a final downside, and this might be more of a big deal to some than others, the beeping sound of the indicator when near a hidden item gets pretty annoying when you can't immediately find said item. It seems like this system is probably better on the console than PC, since I assume you get a controller vibration instead. 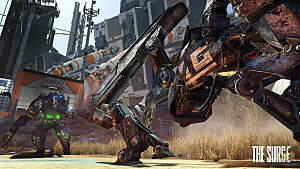 Visually, The Surge's color scheme is really eye-popping, and the animations of the Aliens-inspired yellow exoskeleton feel more refreshing than the more drab Dark Souls/Bloodborne/Nioh style. On the story front, I really enjoyed discovering information about the world and the Creo corporation through propaganda, graffiti, audio logs, and equipment descriptions. 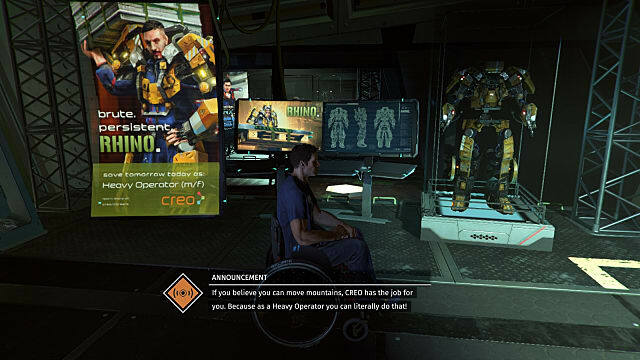 I was frequently reminded of all the darkly comedic descriptions of worker life on Mars in the Doom reboot, and got a good chuckle every time the med bay informed me that "this isn't a scheduled break time" when I went to heal and re-configure my equipment. With several twists on the typical Souls-isms, there's reason even for non-fans to give this difficult action RPG a try -- just beware of the huge amount of grind on the horizon! 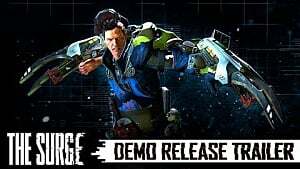 For more information on The Surge, you can check out the trailer below or visit its Steam store page to pick this sci-fi action game up for $49.99. 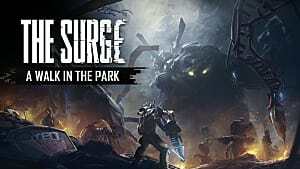 Between severing body parts for upgrades and makeshift hydraulic weapons, The Surge offers a satisfying (if grindy) take on extremely difficult action RPGs.